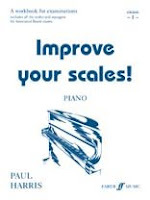 Description: 'Improve Your Scales!' is the bright, fresh way to learn scales and arpeggios - a scale book without scales! Using your 'finger fitness' exercises, scale and arpeggio study pieces, and simple improvisations, Paul Harris' brilliant method teaches students to know the notes and thus to play scales and arpeggios with real confidence. As well as prompting a solid basis for the learning of repertoire and sight-reading techniques, knowing your scales will also help you pick up those valuable extra marks in exams - this book covers virtually all the key and ranges for the major exam boards at Grade 1.